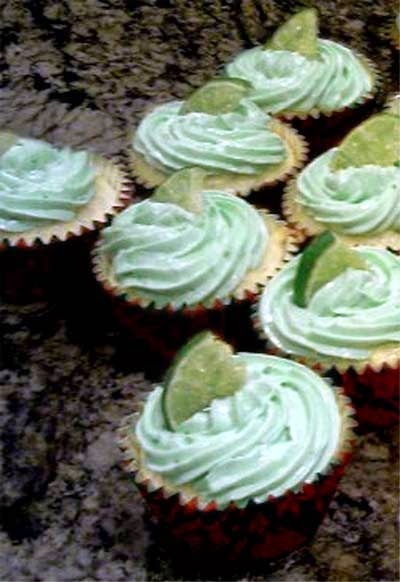 Something to consider on Cinco de Mayo -- Margarita Cupcakes! Basic recipe is from Wilton.com. The minor changes are added in the ingredients. Preheat oven to 350° F. Line standard muffin pan with baking cups. In large bowl, combine cake mix, Margarita mix, egg whites and vegetable oil using electric mixer. Stir in lime zest; mix completely. Fill prepared pans 2/3 full. Bake 22-24 minutes or until toothpick inserted in center of cupcake comes out clean. Cool in pan on cooling rack 5-8 minutes. Remove cupcakes from pan; cool completely. Frost cooled cupcakes with icing and garnish, if desired, with a strawberry and/or lime twist.